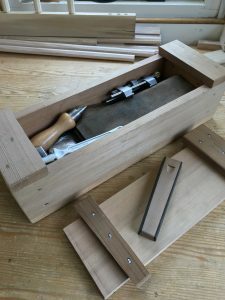 Handtool work is a bitter sweet pill for me as it includes the things I like and dislike the most about the craft; making things blunt and making things sharp. It takes a while to get proficient at sharpening partly because of the range options available and partly because most folk don’t stick with a regime long enough to find out if it suits their style and temperament. For the record I use diamond plates, ceramic stones with honing fluid and a honing guide. 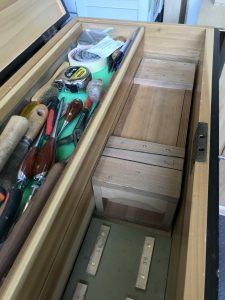 The whole ensemble fits into a small Japanese style tool box that either sits under my bench or in the well of my tool chest when I’m teaching a class away from home. 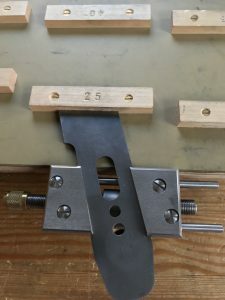 Two things make this setup my kit of choice – the Lie Nielsen Honing Guide and a quick set jig to determine the projection for a range of commonly used bevel angles. 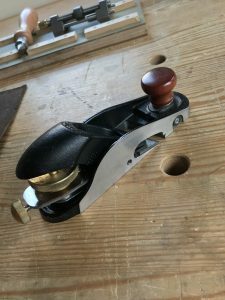 Among the list of essential tools in my kit is the Veritas skew block plane. It’s one of those rare tools that punches way above its weight. Students take to using it like ducks to water and I genuinely feel there’s more than I little magic in the air when it’s out on the bench. The down side is it’s not that easy to maintain a good edge on the iron unless you’re a free hand sharpening wizard or own a Veritas sharpening system. The blade btw is skewed by 15° and it needs to kept that way for the plane to perform at its best. The LN Honing Guide has the option to swap jaws to accommodate different blades – mortice chisels, skew chisels rebate plane blades etc. all designed specifically for the range of LN hardware. 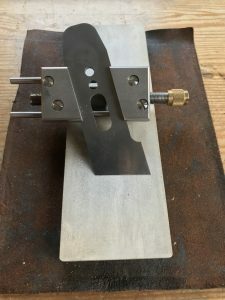 There are 30° and 18° L/H and R/H jaws in the range but unfortunately no 15°. 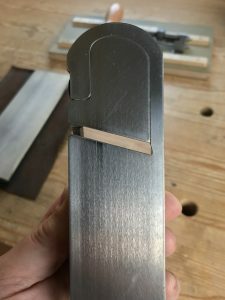 There is some commonality between makes for regular square edge tools but not where the Veritas Skew Block Plane is concerned. The fix? 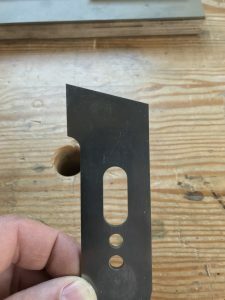 Well, take one pair of 30° RH jaw plates off the rack at your nearest LN supplier and hand them over to your local engineer to turn into a pair of 15° ones. Result – Christmas, birthdays and bank holidays all rolled into one.